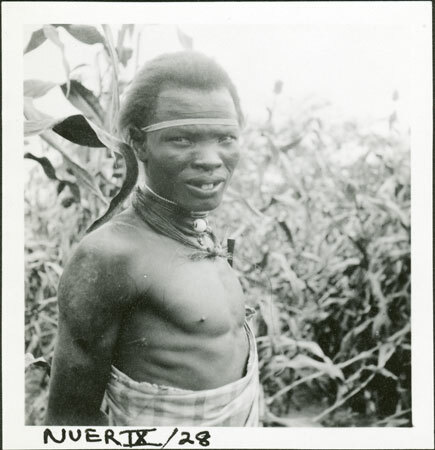 A head and shoulders portrait of a youth wearing a body cloth and neck ornament standing in a maize garden, identified as Tiop, Evans-Pritchard's cook, who was probably first engaged as a servant by Evans-Pritchard during 1931. A photograph of Tiop from this trip was published in 1933, describing him as a Lou tribesman. However, Evans-Pritchard subsequently spent a month in 1935 at Tiop's home village of Mancom at the mouth of the Nyanding River, and notes that this was a Jikany village and not Lou. I have therefore assumed that he revised his understanding of Tiop's tribal identity in light of this later fieldwork. Note on print reverse ms pencil - "3" & print front border ms ink - "NUER IX/28"
Morton, Chris. "Portrait of a Nuer youth" Southern Sudan Project (in development). 03 Jan. 2006. Pitt Rivers Museum. <http://southernsudan.prm.ox.ac.uk/details/1998.355.411.2/>.